Designed to protect the ARB Fridge Freezer from dents and scratches, ARB'ss transit bag is made of tough, durable canvas and comes in an attractive navy blue colour. 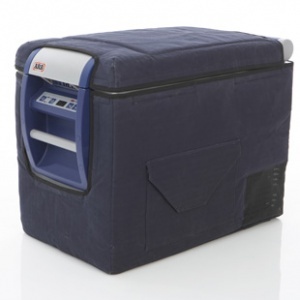 Protecting the sides and lid of the fridge, the bag incorporates a handy side storage pocket and mesh panel that allows the air to circulate for the motor. The transit bag also features openings for the Fridge Freezer's rubber feet, drain plug hole and power cables for the perfect fit. An ARB canvas transit bag offers superior protection for your fridge, and also provides extra insulation in extreme temperatures.